A couple strange scenes where Lesser Nobodies speak? Kingdom Hearts Soft Plushes Arriving August 10th! E3 2013 Recap: KINGDOM HEARTS III & HD 1.5 ReMIX! E3 has come and gone, and with it all doubt in the existence of the illustrious third numbered installment in the KINGDOM HEARTS series has faded away. It's impossible to say that any of us believed KINGDOM HEARTS III would arrive, especially on such short notice. Still, we held onto that small glimmer of hope, and we were certainly not disappointed. There was a lot to take in in not a lot of time, so we invite you to join us as we recap the highlights of the 2013 Electronic Entertainment Expo! We had heard from Director Tetsuya Nomura in the latest Square Enix mdRadio episode that he would be attending E3 2013 because "certain information would be announced". As you may know, it is such a rare occasion for him to make a public appearance, so naturally the community stood up on high alert. And we were proven to be rightly paranoid, as a trailer for Kingdom Hearts 3 burst out during the Sony Conference, revealing the long-awaited title to finally be in development and eleasing for the Playstation 4! The Kingdom Hearts -HD 1.5 ReMIX- trailer didn't quite have the same element of surprise, having been leaked prematurely a week befor the expo. The official release brought about all the nostalgic memories long forgotten and a newfound desire to experience these adventures all over again. With such a dramatic reveal, it'd be difficult to top with another surprise announcement. As usual, Square Enix didn't disappoint. 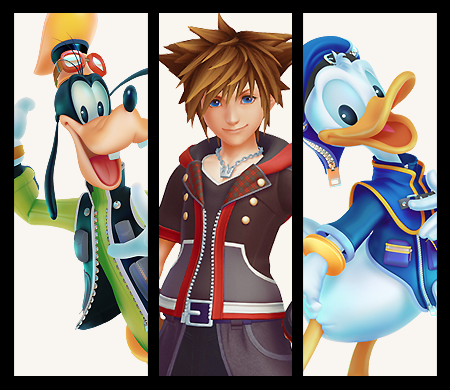 Despite what the name suggested, once we saw the faces of Sora, Donald and Goofy standing proudly alongside the Final Fantasy protagonists, we knew we could surely expect more information at the Future of Final Fantasy event. Here, the game was revealed as the first in the series to go multi-platform with the announcement of a Xbox One release! "Believing light and darkness must remain in balance, Master Xehanort seeks to spark war against the tyranny of light to restore equilibrium. In an effort to undermine Xehanort's plot, Sora, Donald and Goofy search for seven guardians of light and the Key to Return Hearts, while King Mickey and Riku search for previous Keyblade wielders. KINGDOM HEARTS III features a mature Sora as the main protagonist who sets forth on an adventure with Mickey, Donald and Goofy through new and legendary Disney worlds. KINGDOM HEARTS III will make full use of next generation console technologies to showcase a stunning universe packed full of worlds based on Disney properties." Over the course of the expo, Directly Tetsuya Nomura conducted a total of 6 interviews of or relating to Kingdom Hearts 3 and Final Fantasy XV, 4 of which pertain to the Kingdom Hearts series. It's a huge task to search for and filter through each one for specific details, so we've compiled all the important facts about KH3 and HD 1.5 ReMIX below for you to read as you please! When asked once again about his favorite character in the series, Nomura replied this time with the various incarnations of Xehanort, specifically Ansem Seeker of Darkness. Nomura despairs over the fate of the Jungle Book world, which they've attempted to include in many titles and had to cut every time. Nomura hasn't realized it's been so long since KINGDOM HEARTS II, and feels pressure to release KINGDOM HEARTS III as soon as possible. Even though it's taken far too long, the announcement for KH3 seems to have been made too early. "A numbered title" as he describes, is one where Sora is the main character and is aided by Donald and Goofy. They chose to tell stories outside of the numbered titles as there hasn't been anything that perfectly fit KH3. The gameplay will be evolved through KINGDOM HEARTS II, with many elements from the handheld games, Dream Drop Distance in particular. If you want to know what to expect in KH3, you should play KH3D! The HD remasters and KINGDOM HEARTS III go hand in hand. The announcement will bring many old players back to the series, and they can use the remasters to catch up on everything they've missed. KINGDOM HEARTS III is being developed on PC and then specially adjusted for each console, to make porting as simple and convenient as possible. They are currently thinking of ways to make Kingdom Hearts 3 more accessible and easy to understand to returning and new players. He tells us to look forward to the world reveals for KINGDOM HEARTS III, saying they will definitely surprise us. A new outfit for Sora is currently in the works. Next-generation hardware offers up many possibilties to incorporate multiplayer, but at this moment nothing has been set in stone. They are investigating various online elements to incorporate. Summoning will undergo a significant change in comparison to previous titles. We can expect to see the new Organization XIII returning with Master Xehanort at the helm, and that Nobodies will still be present in the future. More Final Fantasy characters will be included in KH3. Playable characters other than Sora are being considered, but he is the definite main this time around. The true Kingdom Hearts, heart of all worlds, may actually appear this time! Special shaders, affectionately named the "Kingdom Shader", will be applied in each and every world to allow for a seamless experience. In previous titles, visiting characters stood quite out of place, and the Kingdom Shader will allow them to match the art style of each world beautifully. The gameplay in the trailer is a pre-rendered FMV, but Nomura feels that the real-time gameplay doesn't differ all too much from what they've shown. The traditional 3-man-party will be used in KH3, though this time NPCs will sometimes fight alongside you. They'd like to enable seamless gameplay with enemies and allies, and offer options such as riding on vehicle-type enemies. Luminous Studios is being used as the primary engine. The usage of DirectX 11 allows KINGDOM HEARTS III to be developed without a specific console in mind. Expect more information at the Tokyo Game Show and the D23 Expo in Tokyo Disneyland. Because it had been so long, almost all of the original data of KINGDOM HEARTS for the PS2 was lost, leading to many assets being remade completely from scratch. They couldn't just release the Final Mixes on their own at this point in time, and decided to bundle them up with several other titles in a collection. Nomura didn't intend on the Days movie being so long. As they progressed through development, it grew to such a monstrous length that he feels they should have just made a proper film from the very beginning. Arielle (Master Spockanort) and Cecily (Sign) were able to play the Kingdom Hearts -HD 1.5 ReMIX- demo at both the Square Enix and Sony booths, and have discovered quite a few interesting pieces of information! The full build of the game was available at the Sony booth, in other words, localization has already been completed. All voice actors have returned to reprise their roles or the original recordings were used in favor of redubbing, with the exception of Christopher Lee as DiZ/Ansem the Wise. Corey Burton now provides his voice in both Re:Chain of Memories and 358/2 Days. An almost completed trophy list is revealed, with different names in comparison to the Japanese version. There is no English lip syncing in either Re:CoM or Days. As expected, the attack button has been remapped to X instead of O.
Yo, Gabba Gabba! Seamless gameplay between enemies and allies! Good recap, caught a few things I didn't see before. Gonna say though, the parts with the white background are unreadable without highlighting and all the links are broken. Huh, I never caught that bit about the Nobodies being present. I wonder what that entails~. Anyway, it might be on my end but the trailer for KHIII doesn't seem to want to play, while the 1.5 REMIX trailer works fine. Weirdness. Thanks so much for putting this together! It is lovely. Glad you like it! Sorry about the issues though, should be fixed now? Great job on the recap! If the localization has already been completed... then WHY are they waiting until September 10th? I WANT MY FINAL MIX NOW! Meh, there's got to be some reason. Also, when you say "There's no English lip-syncing" are you saying that it's the Japanese lip movements with English dubbing? Meaning it looks really bad? I remember Re:CoM's lip-syncing being very poor on PS2. Thanks for the recap, it was really hard to keep up with everything. I'm a little bit disappointed about no lip-sync for Re:com and days, but its a small flaw for something so amazing. Yeah, Japanese lip movements with English dubbing. We only checked a few scenes for Re:CoM but it doesn't look like anything has changed from PS2. Ah, that would make sense! I'll bring it up with the tech team, please let me know if there are any other problems! Well, at least Days is better. It wasn't awful in Re:CoM, but it was annoyingly noticeable how off it was. Oh well. Still gonna play the crap out of that game. Any chance though this was just for the E3 build and will be switched in the final release? After re-playing KH and KHII so many times, I can't imagine attacking with O and jumping with X.
I never knew it was the Japanese standard. I thought they made it like that for the ReMIX's only. I am glad that there are no plans to release any other Kingdom Hearts on a Xbox console...Kingdom Hearts had a exclusive debut on a Playstation and it should stay like that. But as a Playstation fanboy, even that Kingdom Hearts 3 is going to be released on a Xbox one im happy that it has finally been announced. 7 Years of waiting are now over. Can't remember. Must be one of the reasons I didn't like the game. I played until the party left Midgar and that's it. But anyway. It's refreshing, I was kinda annoyed when I was watching videos of I.5 and read that you attacked with O instead of X.
I wonder how will they make it for KHIII. Will the make it different for both Japan and EU/NA or will they make it the same for both? They'll obviously change it, just change 1 or 2 lines of code and its done. Huh, I never caught that bit about the Nobodies being present. I wonder what that entails~..
Basically, the interviewer asked Nomura something about whether the nobodies and Organization XIII would return in this game. Clearly Nomura found it to be quite a strange question and replied that Master Xehanort is the one behind the Organization, so of course that would return. Regarding the nobodies, he just said that there would still be nobodies around, so it's not the end of them. Man I get chills every time I watch this trailer. They will change it to NA/EU standard for NA/EU/PAL and keep it Japan standard for Japan. As it always is. "There is no English lip syncing in either Re:CoM or Days." *Sigh* I know...it is a lot of work to do lip syncing, but still. I figured, hey...remaster. Let's lip sync that ol' Re:CoM we weren't able to do last time. Even more so in Days, but yeah...time constraints and all. It shouldn't be too bad, anyway, so I don't know why I'm ranting. Anyway, still psyched for these games. [*]They chose to tell stories outside of the numbered titles as there hasn't been anything that perfectly fit KH3. Yes they are. They are talking about there was no actual story for KH3 to follow until they made the handheld titles. Might I ask... how was the voice acting for the 358/2 Days scenes? Does it retain the quality that we've come to expect from the series? I'd hope that the lack of English lip-syncing wouldn't hinder the quality of the script and the acting. There weren't any actual voices in the demo. The link to the trophy list takes me to the voice credits page. well, last time RE:COM only had lip synching animations in the prerendered videos, so what if both those and Days are prerendered videos and square didn't send over the source scenes and animations? Honestly, it's not that much of a change, and I've played the NA versions at least twice a year before I got the final mix versions. It's easier on the thumb.